Getting there: We suggest starting from the northern end of the trail. The parking is easier and some of the nicer portions of the trail are in the northern half. 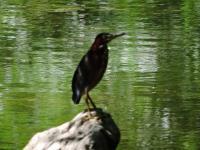 We parked in the Randall's supermarket parking lot on 35th Street, right next to Shoal Creek. There was plenty of parking and the section of the parking lot closest to the creek was completely empty. The Hike: Shoal Creek offers some interesting contrasts in the heart of Austin. At times the creek resembles little more than a drainage ditch. At other times it's hard to believe that you're in the center of the city. Our hike started at the waypoint marked "Trailhead" next to Randall's supermarket on 35th street. 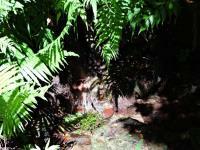 You need not go far in order to see the first interesting section of trail. 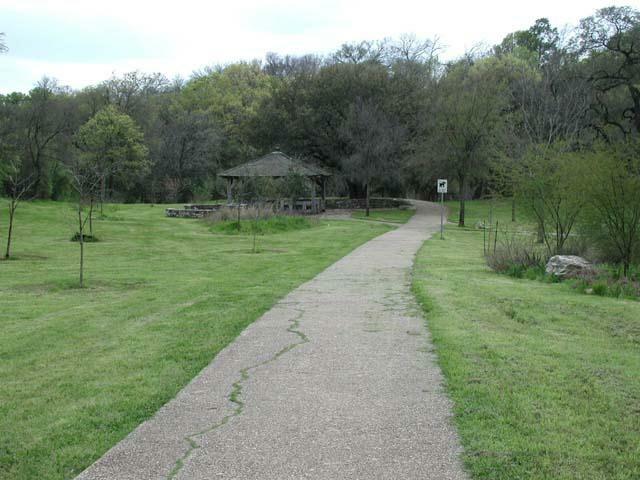 This section is known as Seiders Springs Park. Almost immediately you will see a stand of Oak trees called Seiders Oaks. In 1839 Gideon White built a home here only to die in an Indian massacre in 1842. White's daughter, Louisa, wed Edward Seiders in 1846. 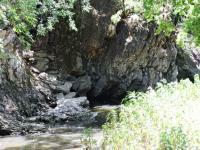 Edward was an enterprising fellow and saw an opportunity in the springs that gushed from the rock face on the opposite bank from these oaks. He built a small resort here after constructing pools to collect the clear, cool waters. Some of those pools exist to this day and we were fortunate to come by during a wet period when the springs were active. 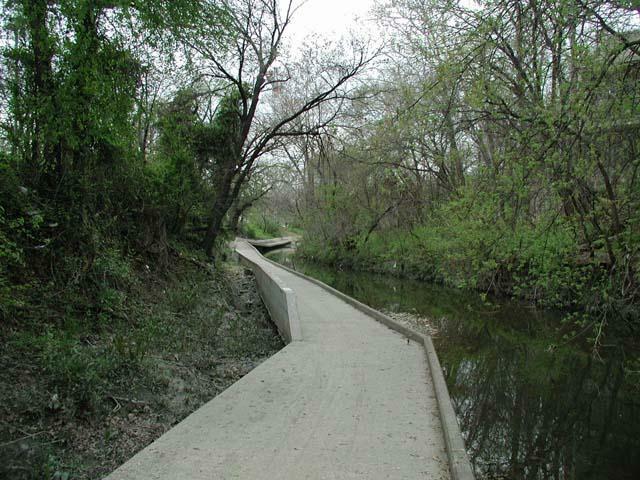 The Shoal Creek trail is fairly easy to navigate, but it does cross the creek several time down its length. Some crossings are easier than others. 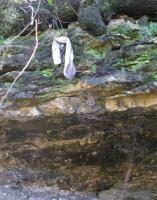 The crossing at Seiders Springs, to get to the side of the creek with the pools was easy. The cement walkway can even be traversed by wheelchair. 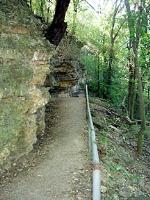 The terrain of the trail varies greatly depending upon the section though. Some parts are paved concrete, some crushed gravel, some compacted dirt. 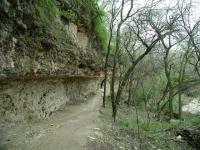 In this regard it provides a bit more of a real "hiking" experience at times than the Town Lake hike and bike trail. 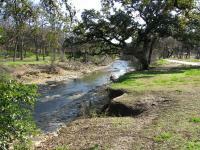 Some sections of the trail can not hug Shoal Creek closely because many old houses are built right up on the creek's banks. Waypoint "Exit Trail" marks on place in which you'll have to walk along 31st street for a couple of blocks until you get to waypoint "Enter Trail", when the trail rejoins the creek. Now you're in one of the most interesting parts of the hike. 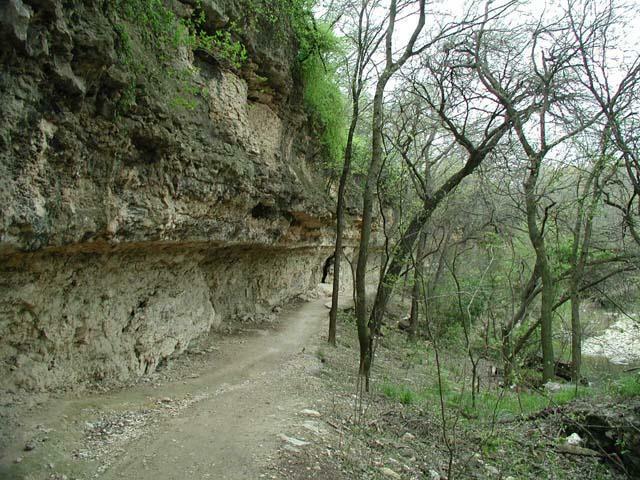 The trail here enters a small canyon of rock and you could very well forget that you in the center of Austin. 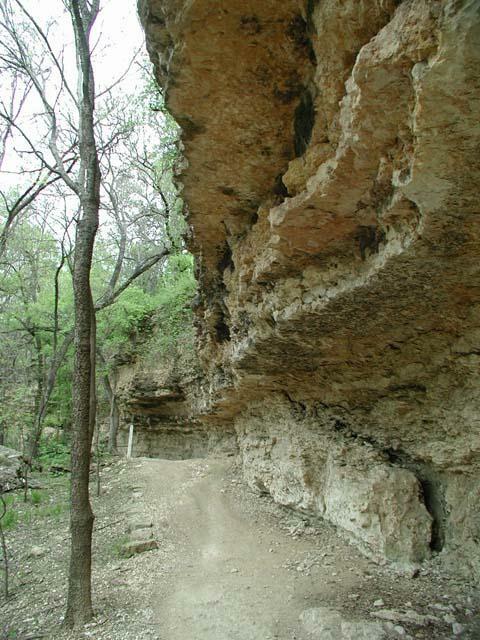 The rock overhangs are impressive and in one small section are low enough that you'll need to watch your head as you pass through. 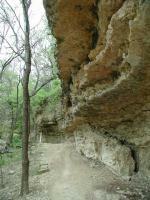 If you elect to only hike part of Shoal Creek, this is one area that you should include in your trip. Once you exit the canyon the trail gets easier. On the opposite bank an impressive rock face remains, but it's largely flat and easy going on the trail side. 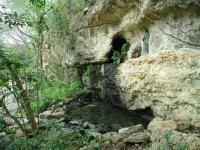 When you get to waypoint "Shells" you'll see an interesting feature of Shoal Creek's beds. At the turns in the creek rocks and shells pile up. Many of those shells are actually fossils, reminders of a time when central Texas was ocean bottom instead of Hill Country. Remember that city ordinance prohibits the removal of fossils from city parks. Look all you want, but leave them for others to enjoy. At waypoint "Pease Park" you have entered Pease Park. With the exception of a moderate hill the going is easy and the grounds well kept. You'll encounter many more people here as Pease Park is one of the more popular parks in central Austin. Pease Park. Note the top of the capital poking out above the trees. If you're not interested in continuing all the way to Town Lake waypoint "Pease End" may be a good time to turnaround. The trail south of here is not nearly as nice and often has no connection with nature to speak of. If you want park-like settings then spend your time north of 15th Street. We're going to trace Shoal Creek to its end though, so we continue on and are rewarded the site of the old Austin Athletic Club building at waypoint "AAC". This building has been around since the 1930's and has stood abandoned since the late 1980's. The trail at this point sometimes resembles a walkway adjacent to a drainage ditch. Every now and then a nice view, but often not very appealing visually. At waypoint "Building Supply Sign" though you can get a little gem of history. We found the back of the old Austin Building Supply, complete with painted sign that you can see here. Just south of the building supply sign is the last creek crossing that you'll have to make in this direction and it's the most tricky. We did not want to go up to street level further upstream and then work our way to the other side, so found the shallowest section of stream and positioned some rocks strategically so that we could hop across. The shallowest section was a couple of hundred feet away from the trail proper on the other side so we had to carefully walk along the decorative stone wall (stairstepped, thankfully) on the opposite bank. The Seaholm power plant dominates the last couple of blocks before getting to Town Lake. 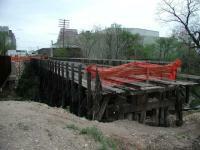 Technically, some part of the trail should be off limits as construction goes on. When we got to waypoint "Gates" though we found the gates wide open and no one around, so we proceeded, knowing that the last stretch of trail was just a bit further up. We were rewarded by being able to pass by the remnants of a railroad bridge on 3rd street. Some of the rails had the date 1928 stamped on them. The fence on the opposite side of off limits area was closed, though someone had cut a sizable hole in it and people came and went as they please. One fellow even got through with his bicycle. 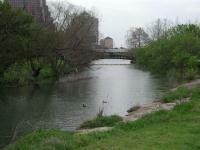 Shoal Creek widens as it gets to Town Lake and makes a sharp left turn just before spilling into it. Waypoint "Turnaround" was the end of our hike as we planned a two car effort so that we would not have to hike back due to time constraints. The total distance for our hike was 4.4 miles and we did this in 3 hours and 50 minutes. Of course we stopped and took photos and looked at fossils, which means you could very well complete the trip in a shorter period of time. One complaint with the hike overall compared to some others is the amount of trash that we saw on the trail, particularly in brush along the creek itself. Given the fact that not much trash was on the trail or in the creek itself, it's likely that the trash was more a result of wash out from the surrounding city that got caught travelling downstream. When you go hiking be sure to bring at least a small bag into which to pick up a few items. Leave the trail in better shape than you found it. If we all did that there would be a remarkable improvement in the environment. I followed the recommendation from the original poster and parked at the Randall's at 38th St. This worked out well, but I didn't care for the several-block stretch on Lamar, which felt unpleasantly exposed and hectic. 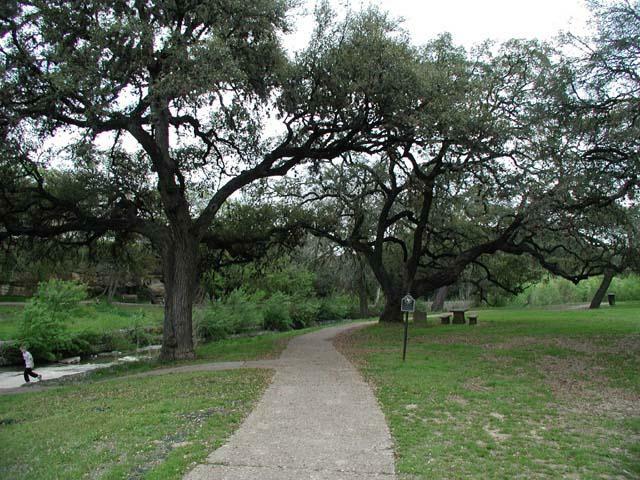 Once around the corner and down along the creek, though, there were lots of cool, shady tunnels of green, and recent restoration work has added a bunch of nice natives, including bigtooth maples, Mexican plums, and a variety of oaks. I'll definitely come back here, especially in the summer. The downsides are that it's a pretty busy trails--lots of joggers and cyclists--and the absence of bathrooms (that I could find, anyway). Next time, I'll start further south, probably in the parking area off Shoal Creek Blvd. This trail is a great way for us Hyde Park folks to trek over to Zilker Park if looking to avoid roads. 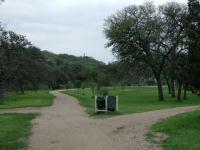 There are some nice off-leash dog areas and Pease Park in the middle! There are some parts that make it hard to believe you're hiking parallel to Lamar, and other stretches that feel veru urban. It's also bike-friendly, which is great! Worth checking out for sure. We did a round trip total 4.1 miles from the front doors of 360 Condos to the 24th st bridge. 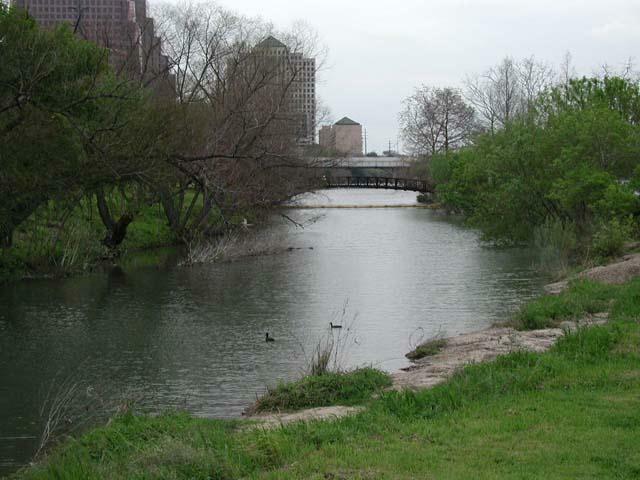 Mostly park and southern Shoal creek which could use with some more clean up. Kids playing in the fountain. Not too many bikers, really significantly less bike activity than Lady Bird trail. The trirock triathlon was going on. Stinky bats under the bridges. Walked from north end for one hour. Did not get to Pease Park. Turned around and walked back. Lots of bikes and Dogs. Pretty clean in most areas. Takes you right into downtown Austin, I like to hit a few spots before the hike back. Have walked this section before and enjoyed it. Decided to do a leisurely night hike and sit and read along the way (Kindle for iPhone--can now read in the dark! Hurrah!) Started right at sunset after eating a delicious cheeseburger at Top Notch burgers, spent a few hours strolling and reading. Used iPhone as a flashlight two or three times for creek crossings or uneven descents, just to be safe, but could have done without as terrain is all pretty easy. Very dark under bridges but I hummed a little tune as I approached so as to warn homeless people camping under them that I was coming. I did not want to shine a flashlight in their eyes so did not use it. Had to keep an eye out behind me for cyclists since I was not very visible and they were not expecting me, but all went quite smoothly and was very pleasant. 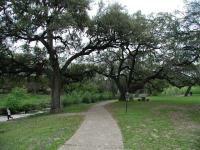 Started at Pease Park near my condo and hiked South to Lady Bird Lake with my Mom. She recently broke her foot, and cannot handle difficult terrain--only problem was one water crossing where we had to step from boulder to boulder, but she was fine in the end. The water in Shoal Creek was kind of stagnant and gross. Frankly I prefer the north end of the trail, but there were neat sections and it got less crowded as we went South (starting at Pease it runs close to Lamar and is quite noisy). Sharing the trail with cyclists was occasionally harrowing (narrow, blind corners) but would have no problem if hiking solo--walking and talking side by side made us a hindrance! Trail closed near the lake, diverted to Butler Trail. Pleasant overall, will hike again. I have no idea if it was really 2.5 miles; I'm totally guessing.